Forget outdated hoverboards with their awful physics! Discover the new hoverboard with a 100% CASTRAY ENGINE which offers you a true HOVER MODE RIDE!!! • The power of the CASTRAY technology will bring you better accuracy and 100% realistic movements and reactions! • No surfaces (Ground Sim, Prim, Mesh etc. ..) including water will restrict you! • Also includes a flight mode. ► DISPLAYED at our STORE! • 4 Channels to multi colors customize parts! 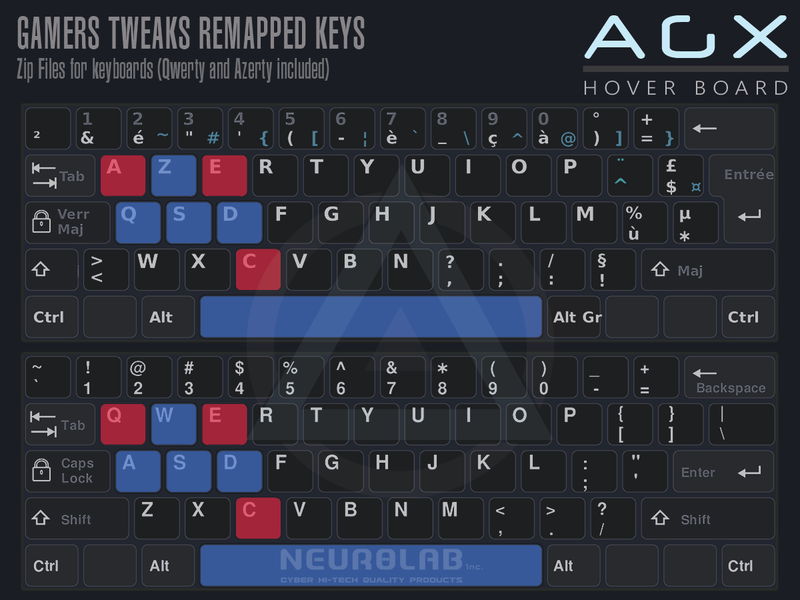 • Remapped and optimized KEYBOARD KEYS for perfect gameplay! • EXCLUSIVE SCRIPTS! NOT FULL PERM or PREFABS SCRIPTS! – You can customize the front and back board colors and Materials independently of each other. – Choose independently your colors, glow and shine for reactors and lights. – Each NeuroLab products Compatible with SMART HUD provides a complete and accurate personalization to make your unique products. – One HUD for all our products NEUROLAB! FAST and EASY! – Synchronize all your products/outfits together with a few clicks. – Selectors by ITEM, SET or ALL (10 m, 20 m, 100 m), unlimited colors, 16 presets ..
– You can customize the color lights / alpha / Glow independently 4 predefined groups for each products. – Access to advanced options for each products. – Retractable Close Open HUD. – NO LAG! Professional Script memory optimization for best performance! 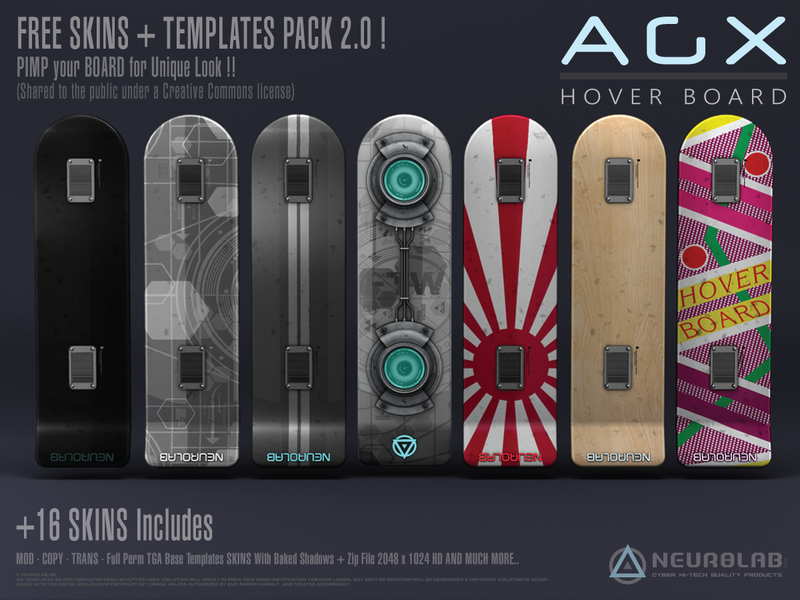 – Wear the AGX HUD and the AGX HoverBoard. 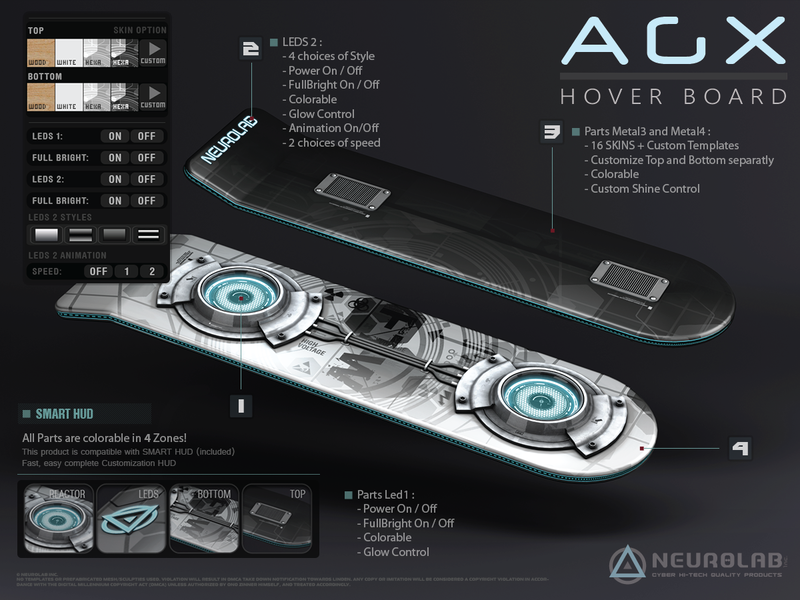 – Rez HoverBoard with your AGX HUD “RIDE button” to the ground. – Wear the SMART HUD. – Connect your HoverBoard to SMART HUD with “Custom” button on your AGX HUD. – Customize/Change colors/materials and others things to your HoverBoard. – Take this HoverBoard in inventory. 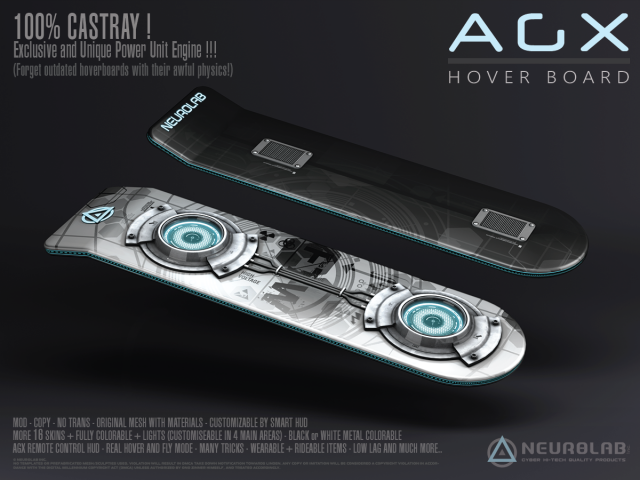 – UnWear and Drop your HUD AGX to the ground, delete Default HoverBoard under content, and drag inside your HoverBoard custom. – Take HUD in inventory, and wear. – Now when you push to RIDE button, its your Custom HoverBoard! – Download the files, and Customize with a picture Software. – Upload your resized format files: 1024×1024 on SL. – Drag then drop the textures in the CONTENT of your AGX HUD. – You can Add SEVERAL images in AGX HUD. – Then you can scroll / change In The SMART HUD (OPTIONS TAB) by clicking on the boards “Custom”. You can send us your custom templates (Size original format JPG or PNG “NLAB_AGX.Board_TITLE_By.Your Name.jpg”) on our email: contact [at] neurolab-inc.com. The bests will be added to the PACK! – SIZE: Adjust the size of the hoverboard to the ground. Allows you to have keyboards keys optimized for perfect gameplay! 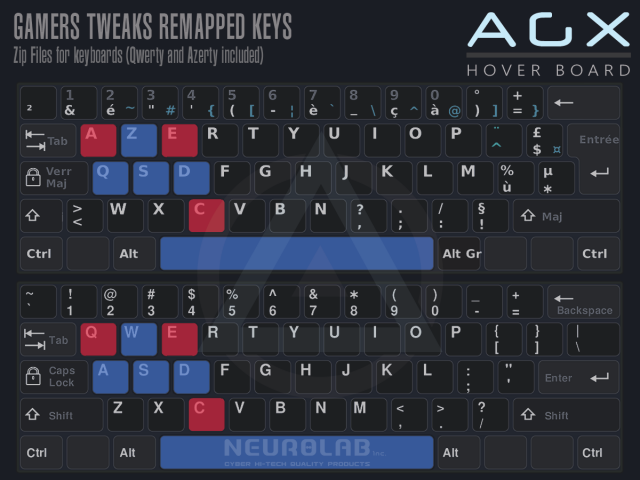 – Qwerty and Azerty Files for Firestorm and official viewer included. You can use shortcut F2 to activate/desactivate the flying mode and F3 to rez your hoverboard. – People can no longer sit on the Hoverboard once the owner is sitting on it. 0.9 Revision: First Beta version released!